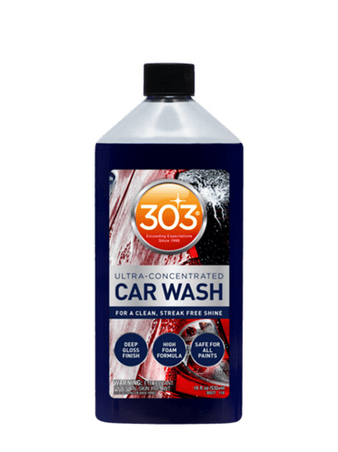 303 Ultra Concentrated Car Wash is a pH neutral car wash soap that leaves a deep gloss finish. This ultra-concentrated car wash soap provides your car with a clean, streak-free finish. The high foaming formula gives you superior lubrication to ensure you don’t scratch your paintwork. It is also pH neutral so it won’t strip wax or coatings. Make sure your vehicle is out of direct sunlight and the surface is cool to the touch. This will ensure you do not get a streaky finish. 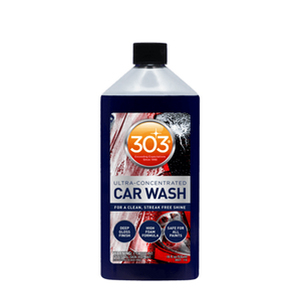 Add 1 ounce of 303 Ultra Concentrated Car Wash to a 5 gallon bucket, and fill the bucket with clean water. Wash vehicle with your preferred wash mitt, and then dry with a microfibre drying towel.